IDS are proud to be an ABB AVP… but what does that mean and why should you care? 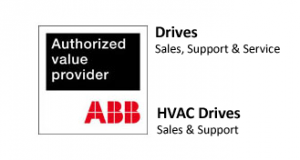 ABB authorised value provider deliver the authorised offering of sales, support, service and engineering in close cooperation with ABB. They bring ABB’s products and services straight to the customer’s front door. Our engineers and sales team are trained to stringent and exacting ABB standards and need to successfully complete assessments for us to maintain our ABB AVP status, ensuring we are technically competent. Being an ABB AVP means we agree to carry a large level of inverter (sometimes referred to as drives) stock, which enables us to respond quickly to our clients’ needs. There are 3 levels of Authorised Value Provider (AVP) for Inverters. We are authorised for the full Sales, Support & Service. We specify, supply, install, commission, repair and service ABB inverters and we are authorised to carry out warranty support for ABB. assistance with client specifics as and when we need it. Did you know? IDS offer an inverter breakdown service. To register your site simply complete the form on our Inverter Breakdown page, we will send you confirmation and a welcome letter. Should your inverters then require emergency attention simply call your out of hours number and we will get you back up and running in a jiffy!